506226. IBERIA, Arekorata. Late 2nd century BC. AR Denarius (19mm, 4.11 g, 1h). 504226. LUCANIA, Kroton. Circa 530-500 BC. AR Nomos (27mm, 8.22 g, 12h). 505926. SICILY, Lilybaion (as ‘Cape of Melkart’). Circa 330-305 BC. AR Tetradrachm (23mm, 17.15 g, 9h). 503349. SICILY, Selinos. Circa 455-409 BC. AR Tetradrachm (27mm, 17.44 g, 8h). 508606. SICILY, Syracuse. Timoleon and the Third Democracy. 344-317 BC. Æ Dilitron (26.5mm, 19.90 g, 3h). Timoleontic Symmachy coinage. 2nd series, circa 339/8-334 BC. 505835. SICILY, Syracuse. Philistis, wife of Hieron II. 275-215 BC. AR 16 Litrai – Tetradrachm (25.5mm, 12.96 g, 1h). Struck circa 240-218/5 BC. 496977. MACEDON, Amphipolis. 369/8 BC. AR Drachm (15mm, 3.76 g, 5h). Heavy (Chian) standard. 489934. ATTICA, Athens. Circa 454-404 BC. AR Tetradrachm (24mm, 17.08 g, 1h). 492710. ATTICA, Athens. Circa 454-404 BC. AR Tetradrachm (25mm, 17.22 g, 10h). 494593. ATTICA, Athens. Circa 454-404 BC. AR Tetradrachm (23mm, 17.19 g, 4h). 505836. ATTICA, Athens. Circa 165-42 BC. AR Tetradrachm (30mm, 16.87 g, 12h). New Style coinage. Antiochos, Nikog–, and Nikon–, magistrates. 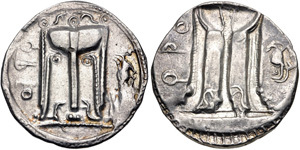 Struck 131/0 BC. 495748. KINGS of PERGAMON. Eumenes I. 263-241 BC. AR Tetradrachm (29.5mm, 16.88 g, 12h). In the name of Philetairos. Pergamon mint. 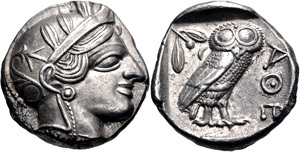 Struck circa 255/50-241 BC. 505837. AEOLIS, Myrina. Circa 160-143 BC. AR Tetradrachm (32mm, 16.40 g, 12h). Stephanophoric type. 504380. IONIA, Uncertain. Circa 650-600 BC. EL Trite - Third Stater (12.5mm, 4.64 g). Lydo-Milesian standard. 491881. PAMPHYLIA, Side. Mid 1st century BC. AR Tetradrachm (30mm, 16.23 g, 12h). Kleuch–, magistrate. 500464. SELEUKID EMPIRE. Seleukos I Nikator. 312-281 BC. AR Tetradrachm (26.5mm, 17.22 g, 9h). In the name and types of Alexander III of Macedon. Babylon I mint. Struck circa 311-300 BC. 507545. SELEUKID EMPIRE. Antiochos I Soter. Joint reign with Seleukos I, 294-281 BC. AR Drachm (16mm, 4.18 g, 12h). Uncertain mint in Drangiana. 479785. SELEUKID EMPIRE. Antiochos I Soter. Joint reign with Seleukos I, 294-281 BC. AR Tetradrachm (28mm, 16.34 g, 9h). 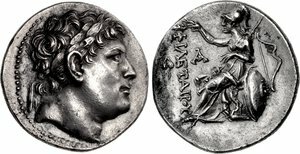 In the types of Alexander III of Macedon. Seleukeia on the Tigris I mint. 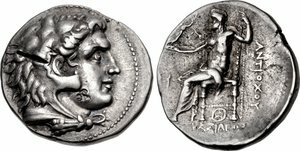 Struck circa 296/5-281 BC. 507549. SELEUKID EMPIRE. Antiochos I Soter. 281-261 BC. AR Tetradrachm (28mm, 17.13 g, 8h). Seleukeia on the Tigris mint. 479231. SELEUKID EMPIRE. Antiochos I Soter. 281-261 BC. AR Tetradrachm (29mm, 16.84 g, 1h). Seleukeia on the Tigris mint.